Everyone’s skin is different therefore treatment should be tailored to each individual’s requirements. A detailed consultation should comprehensively assess your skin problem and draw up a personal plan based on your specific skin type and needs. Prior to treatment, your consultant will numb the area using local anaesthetic or topical numbing cream, to ensure minimal discomfort throughout. The technique directs short, concentrated pulsating beams of light at irregular skin, precisely removing the skin layer by layer. This procedure is also called laser-abrasion, laser peel, or laser vaporisation. Following the procedure, some degree of tenderness in the treatment area can be expected. Your consultant should recommend safe ways to control discomfort when necessary. 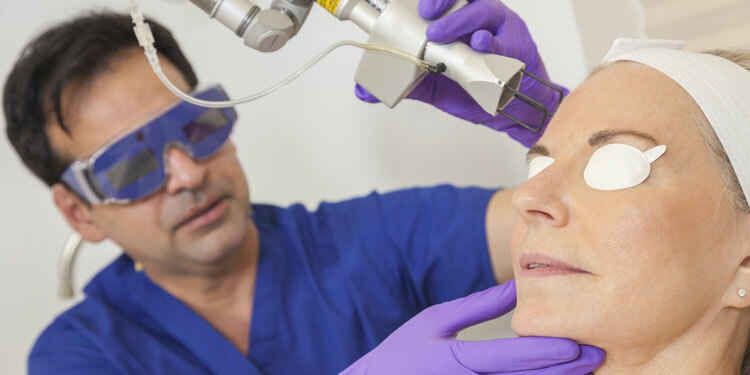 While in some cases, a single laser treatment will take care of a patient’s concerns, most non-ablative lasers call for a series of treatments to produce the most satisfying results. Results can begin to appear within a week to ten days as your skin heals and new cells develop. The key benefit of laser resurfacing is that collagen continues the repairing process below the surface of the skin for months after your skin has healed, and so results get better with time. Because laser-treated skin is hypersensitive to sun exposure for up to a year following some procedures, best to undergo treatment in autumn – in the winter months you will be spending most of your time indoors. After treatment always wear SPF 30 or higher sunscreen daily and reapply as needed. The best way to ensure a safe, effective treatment for your skin type? Make sure you consult with a professional who has extensive training and knowledge in laser resurfacing procedures, as well as experience working with darker skinned patients. You may need to take some time off work initially while your skin is healing. Laser resurfacing uses a specially crafted beam of thermal energy that gets to work deep into the layers of your skin. Unlike peels or abrasive skin exfoliation, these laser beams of heat precisely target and vaporise damaged skin. By vaporising skin cells damaged at surface level, the body works to create new, tighter skin that has smaller pores and fewer wrinkles and blemishes. Treatment time depends on the condition and the size of the area being treated. Small areas such as the upper lip and chin can take between 20-30 minutes. CO2 Lasers are generally ablative lasers used to treat scars, warts, wrinkles and other deeper skin flaws. CO2 uses very short pulsed light energy (known as ultrapulse) or continuous light beams delivered in a scanning pattern to remove thin layers of skin with minimal heat damage. Recovery takes up to two weeks. Erbium Lasers are designed to remove surface level and moderately deep lines and wrinkles and age-spots on the face, hands, neck, or chest. One of the benefits of Erbium laser resurfacing is minimal burning of surrounding tissue, and there are fewer side effects such as swelling, bruising and redness. Recovery time is therefore faster than with CO2 treatment, and in some cases may only take one week. If you have a darker skin tone, then Erbium laser resurfacing would probably work better for you, posing less risk of discolouration. Pulsed-Dye Lasers are typically non-ablative lasers that heat the skin and absorb pigments to reduce redness, hyper-pigmentation, broken capillaries, and rosacea. Fractional Lasers break up the laser energy into thousands of tiny beams to treat only a fraction of the skin in the area, which reduces downtime. Fractional lasers can be ablative or non-ablative, and are used to treat a number of age-related blemishes. Dermatology is a speciality area of medicine dealing with both the medical and surgical aspects of the skin, nails, hair and its associated diseases. The aim of our society includes providing education to our members regarding safe and effective practises within dermatology, mentoring our registrars, as well as enlightening patients in this regard with the aim of maintaining excellent standards.